The Administration site is used by the staff to update the data that drives all of our websites. The site began simply as a way to add users to a staff page, and manage workshops on the OSCR website in 2004. It quickly grew in scope as resources, schedules, teams, gear and many other features were added. 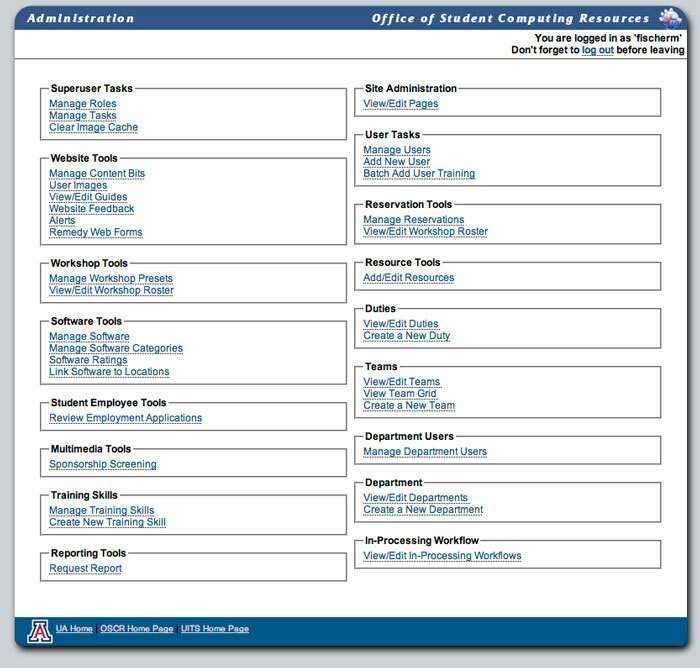 In 2008 the Office of Student Computing Resources was brought into UITS. At that point our web development team was moved from OSCR into UITS. Many of the features of the OSCR website were expanded upon to drive features of the UITS and the 24/7 IT Support Center websites. The website has done very well scaling from a department with about 20 full time employees and 80 student employees, to a department with over 300 employees. The admin homepage displayed all the tools you had access to. A complete role based system ensured that only the tasks the current logged in user had permissions to use were visible and available. We wrote a complete calendaring and reservation system that drives many parts of the websites. 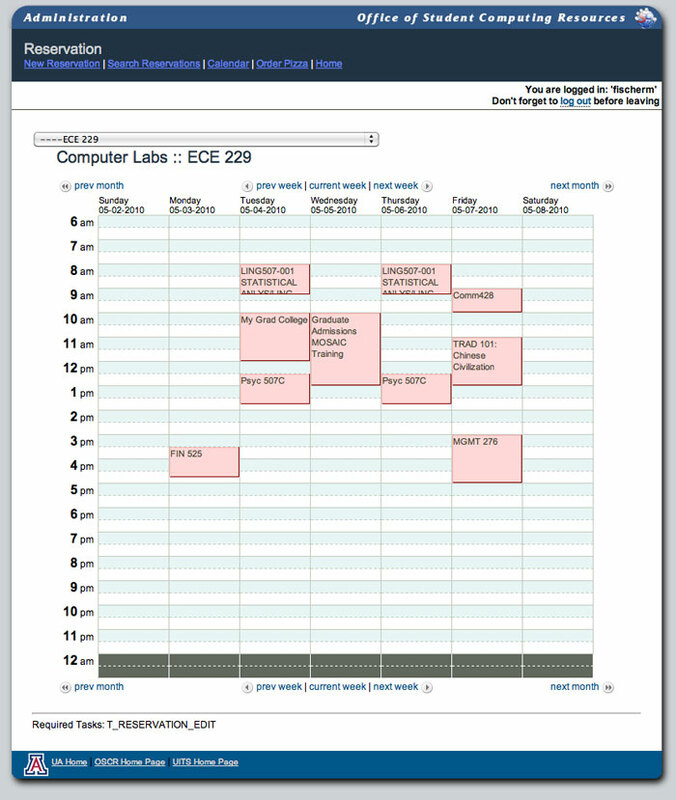 Classes are scheduled in various labs through the tool, and a public facing version of this calendar view lets the public know when labs are open and closed. 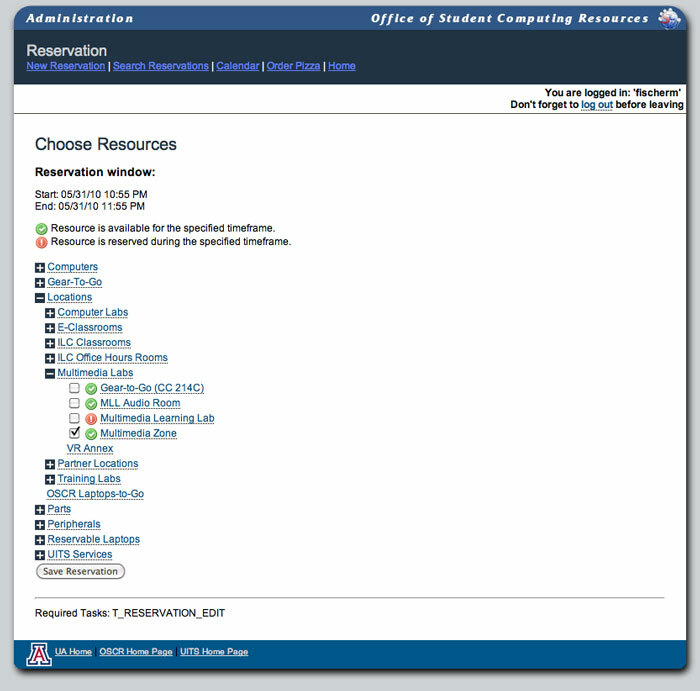 The workshops registration system is also built on the reservation system. New reservations can be of many different types, workshops being one of them. Resources are integrated into many facets of the websites. Resources include a wide variety of equipment, such as the gear for check-out, computers in the various labs, and laptops for department and club check-out. Locations are also resources. Resources can be scheduled and reserved for various functions. The workshop registration system ties into the resource system so that workshops can be scheduled in various labs and classrooms. Conflicts are detected and communicated to those making reservations.